Lucknowi Bharwan Aloo : Potatoes stuffed and cooked in lucknowi style. A south indian freind once told me that poha adds a magical touch to idlis, making it very soft and fluffy. It is 100% true. Try making idlis with this proportion, and you’ll be pleasantly surprised. MethodClean, wash and soak the idli rawa and beaten rice in water for at least 2 hours.Clean, wash the urad dal thoroughly and soak it in water for at least 2 hours. 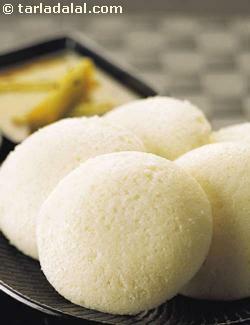 Drain the idli rawa and rice, combine together and blend in a mixer to a smooth batter. Darin and blend the urad dal separately to a smooth paste using a little water. Combine the two batters, add salt and mix well. Cover and keep aside to ferment for 6 to 8 hours. Repeat with the remaining batter to make more idlis. Serve hot. How well do you know your Beer ! When you read about beer you would come across terms like lager and hops. Lagering is a derivative of the German word ‘lagern’, meaning to store or to rest. The young beer is passed through glass tanks as beer needs less oxygen for maturation and the temperature is brought down to near freezing. Certain chemical changes take place due to the yeast and other solids, which develop the immature beer. At the brewing stage, beer is put into the brewing kettle (traditionally made of copper but increasingly being replaced by stainless steel) and then hops are added. Hops belong to the nettle family. the female species of the flower, which contains a narcotic substance known as lupulin (contains tannins, resins, and essential oils). These hops give the beer its characteristic bitter taste, helps in the antiseptic action, cleansing, clarification and preservation of the beer. Ale needs 5-6 days maturation time whereas lager needs 1-3 months. Lager beer: It is a generic term used for all bottom fermented beers, any beer that has been stored or lagered for a considerable amount of time is called lager beer. It is further divided into light lager and dark lager. Light lager: Usually dry in nature light bodied and pale in colour. Dark lager: Brewed in the same way but the colour is much darker. Ale: These are manufactured by the top fermentation method and were made without hops and drunk fresh. Stout: A dark, heavy bodied ale, with a distinct malty flavor. It has a pronounced hoppy flavour and leaves a sweet after taste. Gives a creamish head when poured. Served at cellar temperature/slightly chilled. Porter: Similar to stout but not so strong. It is lighter, less hoppy less bitter flavour and less ale content. It gives a heavy creamy foam when poured. The name comes from the porters of London whose favourite drink was porter. Bock: A strong bottom fermented brew produced in Bavaria, Germany. Though most of them are dark brown in colour, paler varieties are also available. Served slightly chilled, the alcohol content is 6 % by volume and above. Malt liquor: A beer that varies considerably among brands. Some are light pale champagne colour, others rather dark, some are quite hoppy, others only mildly so, but higher alcoholic content than the rest. Wheat beer: Beer made with wheat as the principal source of fermentable sugar. Draught beer: Unpasteurised beer which is stored in kegs/ barrels and carbonated at the time of service. 1. Heat 2 tbsp olive oil in a large casserole dish. Add the onion and cook gently for 10 minutes or until the onion is soft, but not coloured. Add the garlic and the granules fry till brown. Stir the cinnamon, chopped tomatoes, oregano, bay leaves and thyme into the casserole and de-glaze the pan with water. 2. Place the aubergines in a colander, sprinkle with salt and leave for 30 minutes. This draws out any bitter juices. 3. Meanwhile make the béchamel sauce. Melt the butter in a non-stick pan and stir in the flour. Take off the heat and gradually stir in the milk. Return the pan to the heat and stir continuously until the sauce thickens. Simmer over a gentle heat for 5-8 minutes. Remove from the heat, stir in 55g/2oz of the parmesan and 55g/2oz of the gruyère cheese and season with salt and pepper. 4. Rinse the aubergines and pat dry. Dust the aubergines with flour and fry in batches in the remaining olive oil until golden on both sides, about 8 – 10 minutes. Drain on kitchen paper. Set aside until ready to construct the moussaka. 5. The white sauce should now have cooled enough to whisk in the egg and egg yolks. 6. Cover the base of an ovenproof dish (30 x 20cm/12 x 8in) with a third of the SOYA then cover with half the aubergine slices. Repeat the layers, ending in the last of the SOYA, then pour over the cheese sauce. Sprinkle over the remaining parmesan and gruyère. Bake in a preheated oven at 180C/350F/Gas4 for 50-60 minutes, until bubbling and golden. 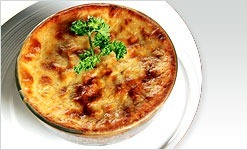 Allow the moussaka to settle for 5 minutes before cutting into squares and serving. 7. Serve the moussaka with a chunky tomato, cucumber, parsley and mint salad and crusty bread. Soak cashew nuts in hot water for half an hour, grind as fine paste with yoghurt,, milk and keep aside…saute the chopped onions, chopped tomatoes with a tsp of oil and keep aside..grind this sauteed onions and tomatoes with all the ingredients from the list ‘To Grind’ as fine paste..fry the paneer cubes in a tsp of oil until they turns slightly brown on both sides, drop this fried paneer cubes in hot water..
Heat the 3tbsp of oil and add the cumin seeds and shah jeera, let them splutters, add the grounded paste along with turmeric powder, redchilly powder, salt and coriander powder, fry everything in medium high flame and add finally the fried paneer cubes with grounded cashew paste…keep in simmer cook until the gravy get slightly thickens..garnish with chopped coriander leaves.. Serve hot with naans, rotis and parathas!